Imbalance exists to some degree in all machines, and is characterised by vibration at a frequency of once per revolution. In the absence of high resolution analysis equipment, imbalance is usually first to get the blame for excessive once per revolution vibration. A state of imbalance occurs when the centre of mass of a rotating system does not coincide with the centre of rotation. Imbalance can be caused by a number of things including incorrect assembly, material build-up, rotor sag, thermal growth and component loss. Along with misalignment, unbalance causes more premature and catastrophic failures in rotating machinery than any other fault. We are able to balance all sizes of fans in-situ in either single or dual planes without the need to remove them from their locations using our state of the art portable vibration data collectors with built-in balancing programs. 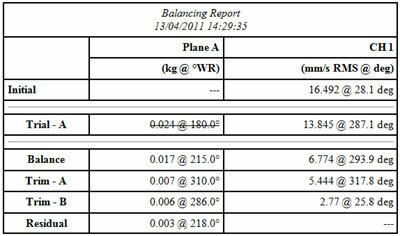 Pre Balance vibration checks can be carried out to pinpoint the issue before balancing commences. Can be carried out whilst adjacent machinery remains operable. No requirement to dismantle and reassemble equipment to enable balancing of machine components. Reduces downtime, labour and material costs. Can be planned into scheduled short time outages such as mould or process changes. Extends bearing and machine life. Reduces the possibility of catastrophic failures. The vbBalancer / vb7 provide a post balance summary report.